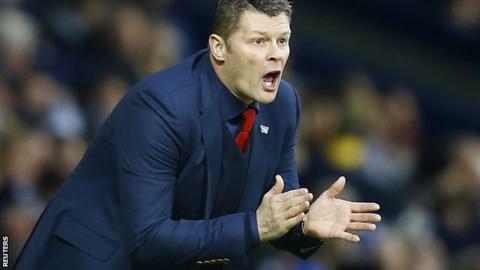 Steve Cotterill has been sacked as manager of Championship strugglers Bristol City. Cotterill took over in 2013 and won the League One title and the Johnstone's Paint Trophy in his second season. He leaves City, who host leaders Middlesbrough on Saturday, in 22nd position, two points from safety. The team have failed to win in seven matches. It is only 256 days since Cotterill led Bristol City to their first league title since 1955. Club chairman Keith Dawe said last season's success "will live in the memory for a long time" but added: "Sadly, since the highs of last March and May things have not gone our way on the pitch. Cotterill had held a news conference earlier on Thursday to look ahead to Saturday's game against Boro. He had discussed the club missing out on the signing of Bolton striker Zach Clough.